Good day my faithful blog readers. This information goes to all Glo users. So therefore, If you have any glo line in use or you have abandoned your Glo line, I would advice you to quickly get it back because Glo is in a happy mood today and they are dishing out 100MB free data with #200 airtime to all Glo users. 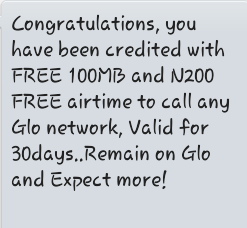 No dulling mood guys, I got mine earlier today, and most of my friends that uses Glo line also comfirmed theirs. So I advice you should check your Glo line and comfirm yours. "Congratulations, you have been credited with FREE 100MB and N200 FREE airtime to call any Glo network, Use it Now... Remain on Glo and Expect more!" Happy surfing.... Don't be a stingy fellow and share this brief information to your friends at home and also your friends on social networks. Did u do anytin to get it. Nd hw wil i check it?